Valentine’s Day has arrived and it’s time to think about love. Most people want to love and to be loved in return, but I’m not sure that American culture promotes love. In fact, although psychologists believe that to be able to love and be loved is an essential element of human development, “true love” is actually having a hard time nowadays. We don’t really live in a loving society. We love things at a distance, like our football teams. We love abstractions, like the weather. But do people feel comfortable about saying “I love you” face to face, even if they are married to one another or think they might marry each other one day? Do they expect to ever love? Is it unmanly to express love? The dictionary tells us that “I love you” means “I am in a committed relationship with you.” Or that there is a potential for a mutual relationship. This means that love is even more than a fuzzy emotion — it’s a state of being. Yet now, in the 21st century, “love” has been degraded to mean something entirely different. Advertising has robbed us of love. It has become a marketing word, used to sell a variety of products and experiences. Here are a few examples from my email inbox. A theater company in Cambridge used “Big Love” as the subject line for its fundraising campaign. “Thank you. With you, we will continue to create work that inspires us to dream big, love fiercely and stand together.” A hair product company’s subject line was “Your new LOVE! + $15 off.” A prominent Boston radio station uses love in its donation request with an image of huge hearts — under which there is a donation button. The McDonald’s slogan is “I’m Lovin’ It,” but the hamburgers can’t love you back. “Cook, Bake, Spread, Love” is my margarine’s pitch, printed on every tub. Subaru is very straightforward; they simply sell “Love.” A recent bumper sticker spotted on the street says I (heart) gluten. 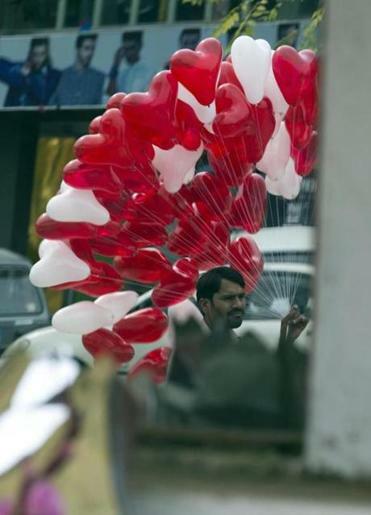 Love on the airwaves, packages, billboards, and greeting card racks is not confined to Valentine’s Day, of course. It’s a year-round come-on for consumerism. And equating purchasing/owning with love is not confined to adults. A British study showed that parents buy for their children so that the children will be liked by their peers. In other words, the things the children urge their parents to buy are intended, in turn, to buy friendship and not let the child feel left out. In some ways, loving things actually IS similar to loving people. We hope that both will last. But everyone knows that the beloved object you buy today will be obsolete tomorrow. Even if “everyone knows someone who loves a Honda,” this does not mean a Honda with 100,000 miles on it. Objects are as subject to aging as people are. Some people even treat other people like depreciating objects, trading them in for new models. Given how “love” is being twisted and wasted on all sorts of things we don’t actually love, here’s a suggestion for Valentine’s Day. Instead of buying something, express love directly, with kind deeds and forthright words. It’s a better antidote for a fractious time than roses, chocolates, or a card. Shulamit Reinharz is the Jacob Potofsky professor of sociology at Brandeis University.